And checking my 1991 copy of the Lloyds register I find for the tanker ARTEMIS (IMO 5378139) the former names to be ARTEM and VENTSPILS) so even in the Bible changes can occur. Obviously since 1959 nobody at lloyds bothered to look at the ARTYOM spelling, but when a sister got renamed ARTEM in 1989, they just took that name for granted. Apologies for ignoring our very own FAQ "note that the official register version take preference over what may be painted on the ship". To be honest there are merits in either course, and at the end of the day, I do not mind which is adopted, as long as they are remain linked by the IMO number. We are not concerned with those who already know the correct IMO number as they will find the right things anyway. Those who don't will either already have a name ARTEM (because they have seen it listed or on a photograph) or ARTYOM (because they have seen it listed). Between those, it is probably impossible to say which would be likely to have the greater practical value. A wicked thought - and one which offends the "consistent naming" principle, but would be of practical help: why not rename all of them ARTYOM in accordance with our existing policy, but leave this one as ARTEM so that it can be found by those looking for that name (don't forget that ARTEM in LR likely takes one to the wrong ship). Those arriving here will find this discussion, but all the ARTYOMs will be linked anyway. I really like this kind of "investigations" to get the right id of a ship. All experiences are interesting to me specially when final result is found. Whoever (amateur or specialist) is participating to such "investigations" contributes to rewrite a forgotten story. Sometime either with a happy end when ship's id is found or not when people still work to find it, comparing their data with other one's. Sorry for my broken English but I wanted to express a feeling about this ARTEM discussion. Bob, having had many dealings in the past with the people from Lloyds Register, who were trying to sell information, I am not convinced that they alone can be considered the gospel truth. Transcribing cyrillic or chinese has always been an issue as you rightly said. In case of Russian ships I am more inclined to follow their transcript of Russian names than that of LR. Bob, there are many people on this site who have serious knowledge in maritime history and are not "amateur enthusiasts". Lloyd's Register is a good reference point but as i have found after many years of maritime research, it also contains many records with errors (especially the older editions). By cross-checking our info and knowledge from various sources we manage to compile more correct data about our beloved ships. People here are not as amateur as you consider them to be ! Then, Pieter, for the reasons given in my comment below, we must agree to differ. I am not yet ready to consider this amateur, enthusiasts' website to be more authoritative than Lloyd's Register of Shipping. Bob, the name on the bridge wing says "ARTEM" I am personally in favour of using names that are painted/carried on the ship. Not everybody has access to LR. And as long as the IMO number is the correct one, we know which ship we are talking about. Thnks again to all, especially to pieter melissen, for the detailed information. Now I hope that the data is correct. It seems quite illogical to me to give the ship a name on this site which, if you look it up in LR, you won't find it. 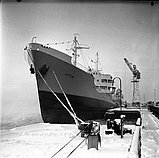 There has always been occasional variance between Russian ships' names on thier bows, bridges and in Lloyd's Register. We are told repeatedly that Equasis is the arbitrator on for postings on the site. Equasis gets its info from LR so surely it is logical that LR should be the "bible" when it comes to older vessels from before the time of Equasis. Nektarios, no worries, I also had to change the IMO number of the shot I posted myself, I fell into the same trap. A big thank you to all for the clarification. I used the IMO i found on the site without checking it first (please accept my apologies !). This is indeed 5025811. And as Bob says, named as ARTYOM in my Lloyd's Register 74-75. Was also worrying away at this one Pieter, and reached the same conclusion - all these are the same ship, IMO 5025811. Indeed, I suspect that the VENTSPILS never was officially known as ARTEM, but in view of your comment on their last known days, who knows what could have been going on. A word on the name. ARTEM indeed seems the right name for us to use. Although written in Russian as APTEM (a Ukrainian christian name), it was probably really APTËM, which is pronounced "Artyom", not only a Russian christian name but also several places in Russia - so far as I can tell all of this class of tanker were named after places. It seems that, perhaps following their practice at the time, they did not use the "Ë" on the ship. Found a couple more ARTYOMs and changed them, though one is an inadvertant duplicate and will be deleted. DDG HANSA, yes I am sure, I have changed all the shots of her from IMO 5378139 to IMO 5025811. There were two shots of her under this number, both taken by Jan Melchers, who had used her alternative name ARTYOM which I changed. (as on the bridge it reads ARTEM). You will note that other photogaphers had problems with the name and the date at which the shot was taken. 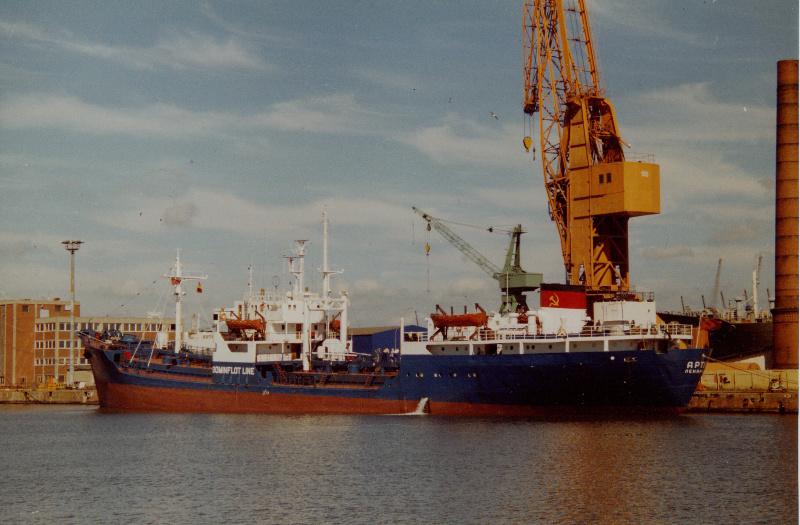 The other ship was originally named VENTSPILS up to 1988, when she was renamed to ARTEM (in spite of the fact that there was already another ARTEM under the Russian flag. The second ARTEM carried this name only for a short period as already in 1989 she was renamed FAIR FOX in 1989. She was built as Yard No.98 also by RAUMA REPOLA. Both ships ended their lives in the Middle East, and perhaps, I repeat perhaps, both were involved in illegal all trading in that period, which could explain why the identification was so difficult. I have taken these data from Miramar, although other source indicated that VENTSPILS was broken up in 1988, which would rule out the possibility the she was ever named ARTEM. In short: a shot of the ARTEM taken before 1988 can only be 5025811 and your shot, shown dated 1994, has an incorrect date. Sure? See the information from Nektarios Papadakis. DDGHANSA, but I think you have added the wrong info to your shot. The photo in the link below was shot in 1986, which means that that ARTEM can only be 5025811. As it is unlikely that both ships were under Bominflot charter, I suggest that also the ship in this photo is 5025811. ARTEM: 5378139, which carried this name from 1988 to 1989 when she became ARTEMIS. and ARTEM :5025811,which delivered as ARTEM and carried this name until 1989. This photo has been shown 1,254 times since it was added to the site.